Tortillas filled with black beans, corn, onions, tomatoes, jalapenos, covered with cheese, and Red Chile Sauce then bake. Perfect for a quick, easy, pulled together weeknight dinner. Heat a large skillet over medium heat. Add 1 tablespoon extra virgin olive oil, onions, corn and taco seasoning to skillet. Sauté 2 to 3 minutes until onions start to soften. Add tomatoes, jalapeños, black beans and ¼ cup water to the skillet and stir to combine. Stir occasionally another 4 to 6 minutes, the mixture should start to thicken. Taste and add more taco seasoning to taste. While taco filling is sauteing in the skillet, preheat oven to 375 degrees. Remove from heat and stir in ½ cup of the cheese and chopped cilantro. Spoon a heaping ¼ to ½ cup of the mixture into folded tortillas, depending on the size tortilla you are using, place filled tortilla in baking dish. When tortillas are filled, top with Red Chile sauce also known as enchilada sauce and remaining cheese. Bake in preheated oven until cheese has melted, about 6 to 8 minutes. 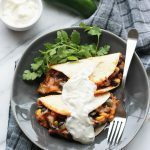 Serve tacos with your desired toppings, I like to serve mine with vegan sour cream.